The oversexualization of female characters is a hot-button issue in superhero comics, so there was reasonable cause for concern when DC announced a new series based on a line of collectible statues depicting its female heroes and villains as ’40s-style pin-up girls. 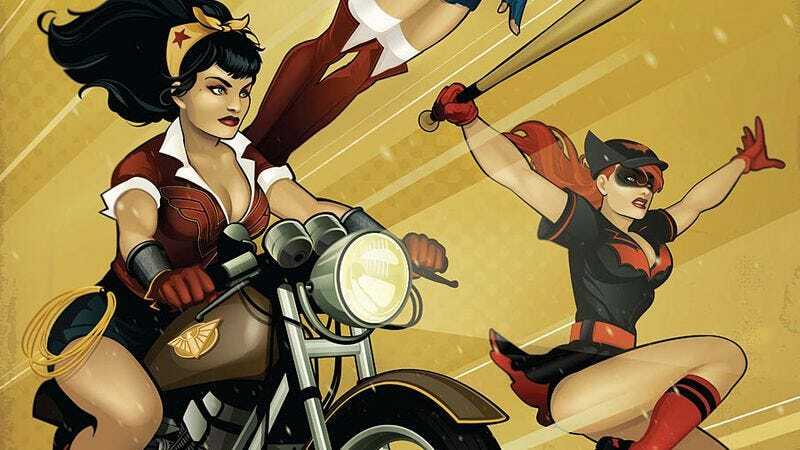 Attaching a creative team of women to the project suggested that the final product would be more than just cheeky cheesecake, but the high quality of DC Bombshells #1 (DC) is still a big surprise considering the book’s titillating source material. Wonder Woman’s story is relatively unchanged from her classic origin, and while it’s an effective telling, the majority of this book’s charm comes from seeing how the creative team deviates from tradition with these characters. How will Kate Kane’s romantic relationship with Maggie Sawyer be impacted by the time period? How will Supergirl’s alien powers be viewed in World War II-era Communist Russia? Hopefully the creative team will dig deeper into the questions posed by the setting and time period, because that will further differentiate these characters from their mainstream DCU versions. While Bennett is the ongoing writer, DC Bombshells features a rotating team of female artists, and it’s nice to see DC committing to a female perspective for this series. Sauvage sets the bar high for future creators like Laura Braga, who has already drawn two chapters of the Bombshells digital comic, and Bilquis Evely, the artist of Dynamite’s excellent Shaft miniseries, and having Sauvage establish the character looks and visual tone of the series at the start provides a strong foundation for the rest of the team. Sauvage pulls from various inspirations for the fashion, and of the characters in the first issue, Batwoman is the only one who wears her Bombshells costume. Wonder Woman wears a toga with armor over one breast, a clever shout-out to the mythological Amazons removing one of their breasts, and Stargirl and Supergirl wear simple gray fighter pilot uniforms. Fans of Cartoon Network’s first miniseries Over The Garden Wall got a small second helping with last year’s one-shot, which provided another adventure of adolescent Wirt, his little (half) brother, Greg, and the talking bird named Beatrice as they journey through a forest lost in time. Now series creator and writer Pat McHale offers a welcomed robust extension with four new issues from KaBoom Studios. Over The Garden Wall #1 (KaBoom!) finds Wirt, Greg, Beatrice, and Greg’s frog in between episodes three and four; the end of the comic cleverly transitions into the opening scene of the miniseries’ fourth episode, even providing the reason for the mad carriage ride through the woods that isn’t explained in the show. Creator and writer Pat McHale (a writer and storyboard artist on Adventure Time and The Marvelous Misadventures Of Flapjack) aptly captures the characters and tone of his show on the pages of this issue. Jim Campbell’s art isn’t as painterly and lovely as the artwork in the miniseries—the lurking depths of the woods nowhere near as creepy—but the characters and surface settings are identical. While the comic medium proves to be an ideal way to tell another story of the boys trying to get home, this issue is closer to a television show’s storyboard plunked down in comic-book form. There are no techniques specific to comics here, which is odd, considering the previous one-off superimposed Wirt’s inner voice on text over the action to great effect and played with panel composition to convey a jarring sense of action. Wirt’s neurotic thoughts also provided a nice expository element that caught up readers who might not have seen the show, but this issue makes no attempt to explain why the brothers and a talking bird are trying to catch a carriage through the woods in the opening page. Carrying on a plotline from the show, Beatrice is thoroughly exasperated with Wirt’s lack of gutsiness and seeming inability to get out of his own head for one minute. When Wirt falls on a bed of flowers, revealing a neat little yard in front of a big, scary house, he’s roped into doing “chores” for the sisters who live there. Greg, as usual, has his own side adventure, a whimsical, mostly imaginary mystery that captures how children make up their own stories. In keeping with the surreal, pastoral characters that populate Over The Garden Wall, the two sisters who live there are tiny, talk like they’re out of Little House On The Prairie, and wear bonnets so large their faces are obscured, making them look like their entire heads are nothing more than their headwear. The first issue of Kurt Busiek’s Astro City shipped in August of 1995, and it would be difficult now to overstate the degree of anticipation with which the series was met. One year previous Busiek and Alex Ross had collaborated on Marvels. That series hit the industry like a thunderclap, arriving with little fanfare but almost overnight turning Ross into the biggest artist in an industry still suffering through the aftershocks of the Image explosion/implosion. Busiek became popular, too, although his particular kind of “overnight success” had been preceded by 12 years in the trenches doing piecework like Red Tornado and Darkman. Marvels was a complicated work that represented both a celebration of “traditional” superhero comics and a critique of the nostalgia culture that ensures the genre’s viability. It catalyzed the neo-traditionalist movement of the mid-to-late ’90s that served as an explicit rebuttal to the perceived cynicism of Image and its followers. The movement had its apogee in 1996’s Kingdom Come, in which Ross teamed with Mark Waid (then famous for his character-defining run on The Flash) to deliver the final nail in the coffin of the “extreme ’90s.” But Kingdom Come wasn’t quite the sequel to Marvels it was received as. The same nostalgia which Busiek and Ross had skewered was seemingly embraced wholesale, and the result—while often breathtaking—often came across as a lecture to a generation of wayward creators from their elders (to say nothing of the fact that, for example, Rob Liefeld is two years older than Ross). Astro City was and remains the true heir to Marvels, thorny self-critique and all. (Fittingly, Astro City was initially published by Image.) The series is also 20 years old this month, a fact celebrated in this week’s Astro City #26 (DC/Vertigo). The creative team is the same as it was those many moons ago: Busiek in charge, with Brent Anderson on art and Ross on covers and character designs. Although there have been many disruptions over the years, due to illness, overwork, and a few re-launches along the way, the series remains as dependable and interesting as ever. The anniversary issue is a sequel to the very first Astro City story, “In Dreams,” titled, aptly, “In Dreams 2015.” The subject now, as then, is Samaritan, Astro City’s Superman analogue, a supremely powerful and ceaselessly busy hero who can only enjoy the sensation of flight in his dreams. Twenty years later he is still harried, but there’s something different now—is it a midlife crisis? A psychic attack? Maybe just exhaustion? The answer is itself a callback to that first story. The issue is full of such callbacks, showing the changes in Asa Martin’s life over the last 20 years—an immortal superman surrounded by an ever-changing cast of characters, heroes, villains, and more. Winged Victory, who appeared in passing in the original story as one of Samaritan’s possible loves, reappears now as his long-time lover. Magic users have often landed in an awkward spot in big two comic books, particularly for DC. Many characters who were formally magic or mythic are now extraterrestrial, and perhaps audiences find these new alien origins easier to swallow. There are outliers, of course: John Constantine comes to mind immediately. But magical characters can easily feel dated and on the wrong end of retro. Thankfully, the creative team behind the new iteration of Doctor Fate has fully embraced the weirdness and uncertainty of just how ancient magic works, and their enthusiasm gives the character a fighting chance. For the first time in mainstream continuity, Doctor Fate isn’t a white guy. Doctor Fate #3 (DC) pushes soon-to-be med student Khalid Nassour further into danger as forces he doesn’t quite believe in bring massive floods to his New York neighborhood. Armed only with a gold helmet, some vague information from a talking cat, and the occasional visit from a ghost, Khalid is struggling to hold back a literal tide of disasters. As Khalid becomes a pawn in a much larger game than he knows, frequent visits to his father and mother in the hospital give the reader historical context for just how Egyptian diaspora to the U.S. has impacted their lives. It’s an interesting new take on an old-fashioned character. No longer is Doctor Fate a professor or a looter, but an Egyptian-American young man chosen for the role. It’s a rough and inexact metaphor for some of the larger diversity-driven changes happening at DC right now, and maybe that feeling of meta-commentary is intentional on the part of writer Paul Levitz, a frequent contributor to many DC books and author of 75 Years Of DC Comics: The Art Of Modern Mythmaking. Clearly knowledgeable about the company’s publishing history and where the character has faltered before, Levitz is bringing something fresh to the book with Khalid and his family. Levitz and artist Sonny Liew are listed as “storytellers” on the opening page, with credits for letterer Nick J. Napolitano and colorist Lee Loughridge below. In the face of an industry with a big problem properly crediting hardworking artists, it’s a charming and telling gesture. Like a lot of other books in the DC You push, Liew’s art is a departure from the DC house style, a little more sketchy and caricatured. He’s worked on a slew of books from other publishers before, perhaps most notably The Shadow Hero with Superman writer Gene Luen Yang. The panels are full of detail, lending Khalid’s home and neighborhood real weight, and Loughridge’s penchant for monochrome color palates works really well here. As the neighborhood fills with water, everything stays a washed-out blue, with Khalid’s flash of gold attracting the eye effectively.